What factors affect the ways individuals participate in labor markets? "New Developments and Research on Labor Markets" (volume 4B) proposes answers to this and other questions on important topics of public policy. Leading labor economists demonstrate how better data and advanced experiments help them apply economic theory, yielding sharper analyses and conclusions. The combinations of these improved empirical findings with new models enable the authors of these chapters to reveal how labor economists are developing new and innovative ways to measure key parameters and test important hypotheses. Graduate students and professors worldwide working in all subdisciplines of economics. "Labor economics" has continued to expand both in the extent and depth of coverage in recent years. Volume 4 of the Handbook has succeeded in not only updating coverage in many areas, but in synthesizing studies and approaches in ways that contribute importantly to the field. Economists with interests in many areas, ranging from field experiments to gender to early-life human capital investments, will benefit from the excellent chapters in this volume." 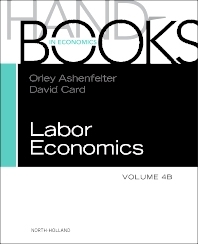 "Volume 4 very nicely illustrates several important trends in labor economics: increased concern about proper research design, more contact with those in other social sciences, greater reliance on data collected by those conducting the research, and (in some areas) more productive interplay between theory and data. The authors have themselves been major contributors to these developments; they combine a participant's enthusiasm with a detached perspective on the challenges and gaps that remain." "The entries in the Handbook of Labor Economics update, deepen, and broaden the analyses contained in earlier volumes. The first-rate papers here address important problems in labor economics, often from new perspectives. As is the case with Volumes 1-3, many of the papers in volume 4 are "must-reads" and sure to make it onto graduate reading lists."